When I look at some of the ornaments from the past, they leave me awestruck! 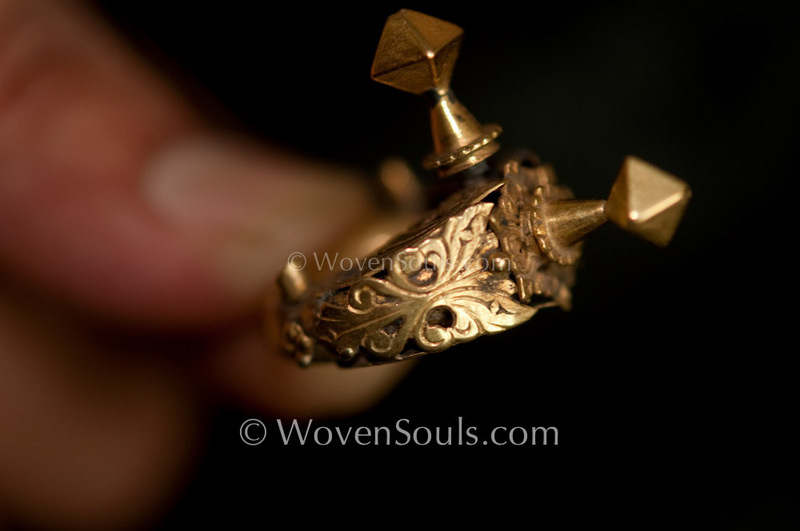 The art & craft within them is doubtlessly stunning. But beyond that, there is an element of mystery. 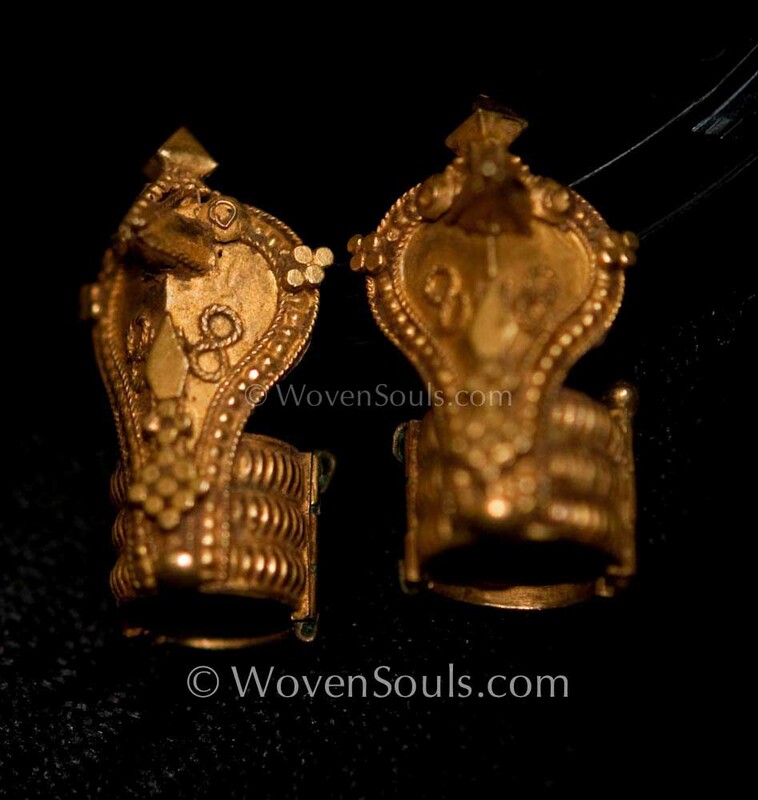 A mystery that may be solved only by time travel – since there is very little visual evidence that explains HOW these pieces were worn. This majestic Nag looks daunting but is less than 2cm tall. 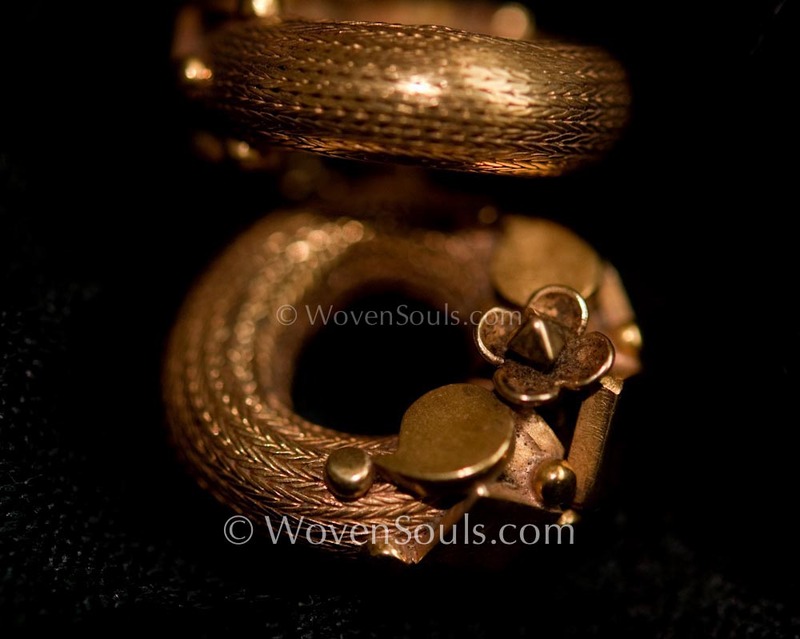 The ring formed by snakes’s coils opens up and when closed it has the diameter of about 0.7 cm. The question remains – what part of the body does this adorn? Were these for humans? Were these for carrier pigeons? 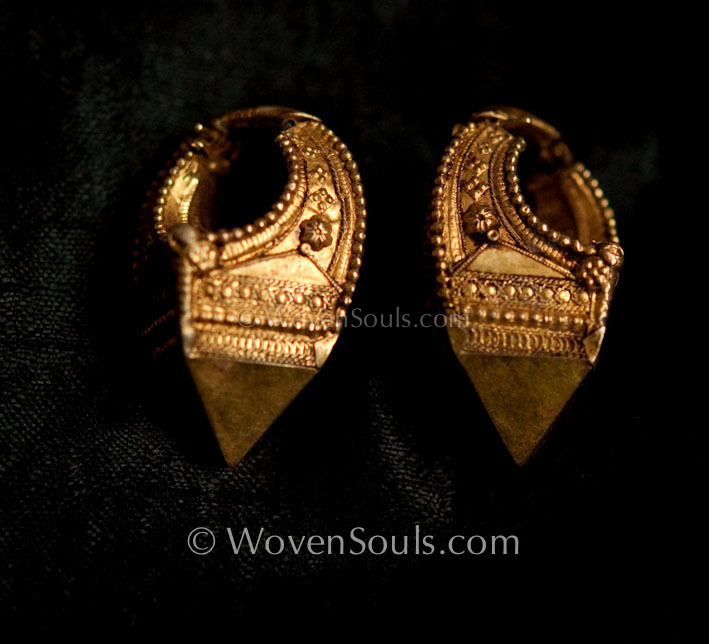 Were these for adorning statues of Gods? Did these adorn hair braids? 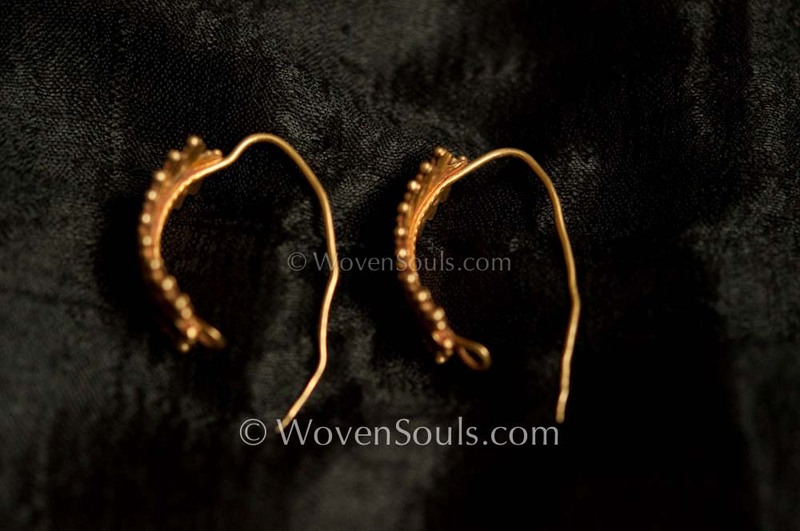 SET 2: WOVEN EAR RINGS. Each of these has an outer diameter of about 2cm and is about 0.7cm thick. Where would these fit? In India every woman wears earrings. And over the years, earlobes get distended and ear holes elongate from the weight of the earring and often tear. These are then surgically sutured or glued. 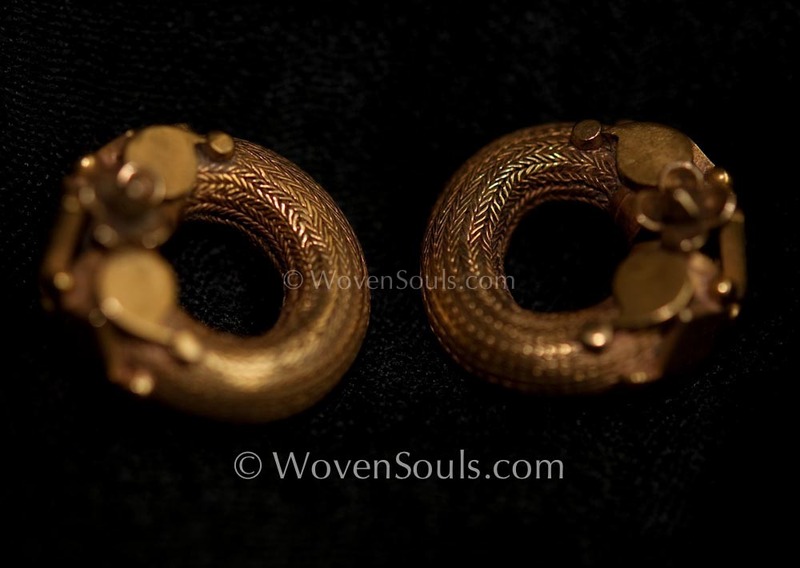 This happens when normal small earrings are worn continuously so I wonder about the impact of these heavy pieces with the large hoops that require large earholes! 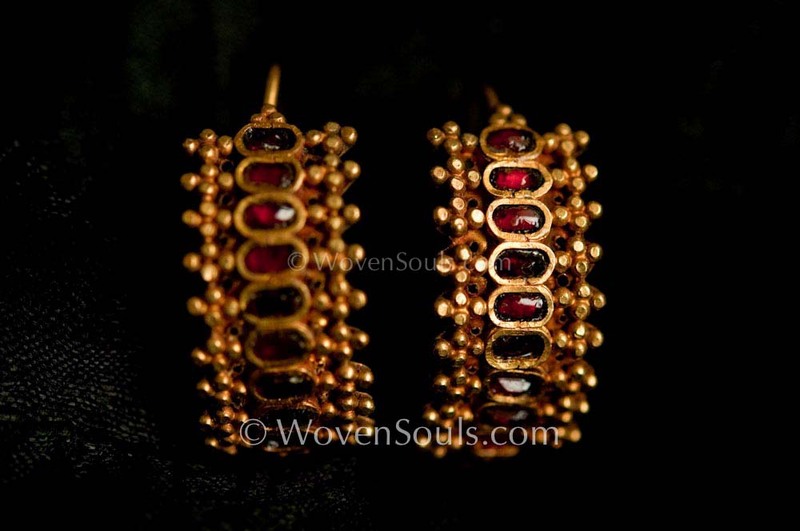 The gold-thread-weaving is simply fantastic! SET 3: A THREE DIMENSIONAL PAIR. The second picture shows the 3-D effect. What was the purpose of having such dangerously pointed earrings? 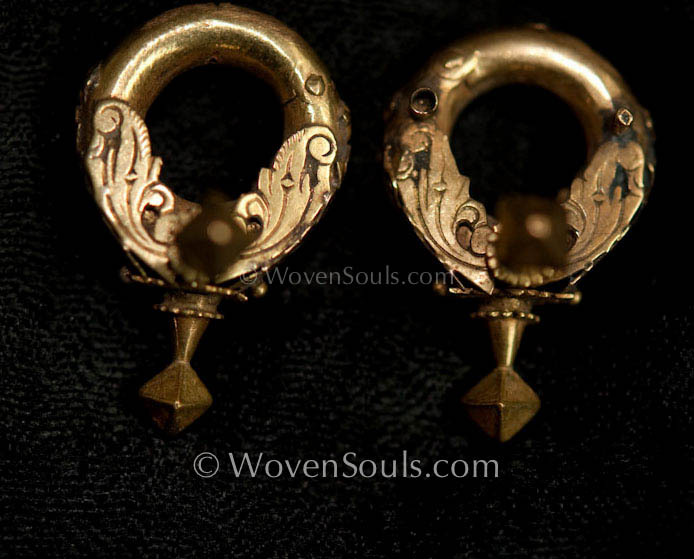 Were these earrings? SET 4: HEAVY PIECES WITH LONG END. Maybe these are worn in a earhole at the top of the ear? 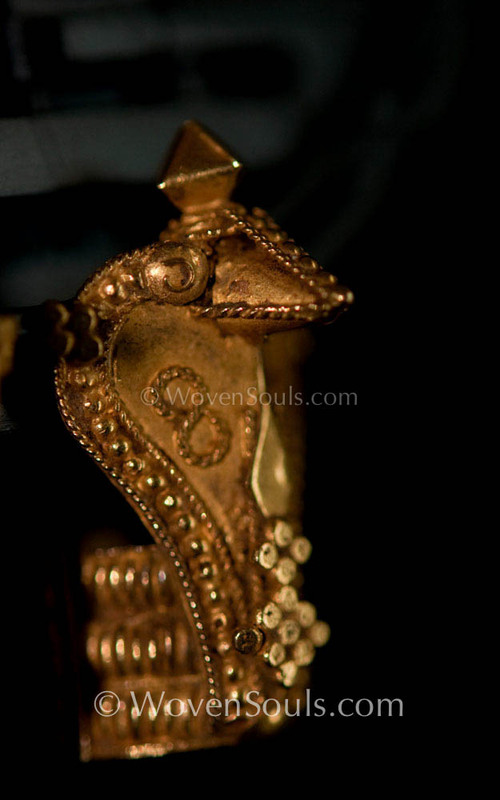 These are similar to the pieces seen in the sculptures of Angkor Wat. Almost as large as ears! 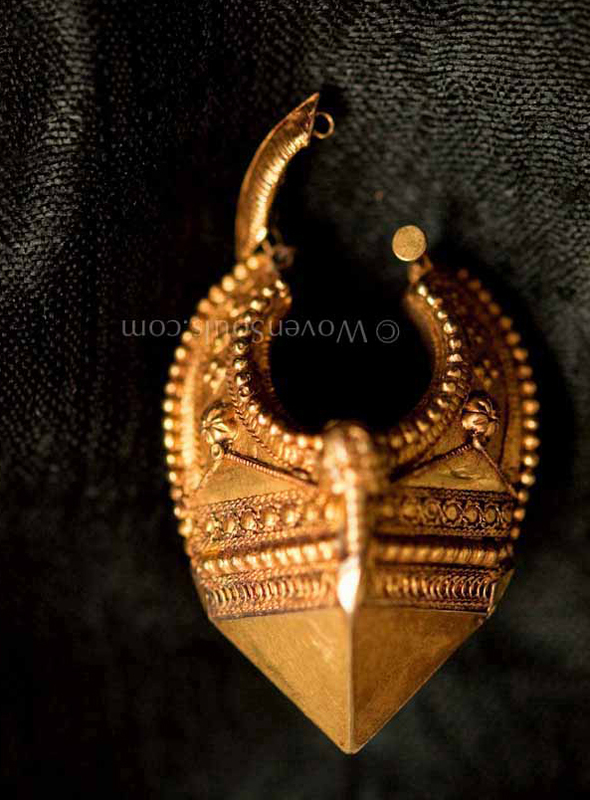 The Kirti Mukh Motif decorates this piece that has a unique format in which the earring hangs perpendicular to to the plane of the earlobe. There are 2-3 other pieces in the collection that have confused experts and need to be explored further. If you have any such pieces please share pictures. And if you have information about such pieces please share that too! The beauty if the art and the enigma of the form is so mind-consuming and addictive!! But what a happy addiction to have! 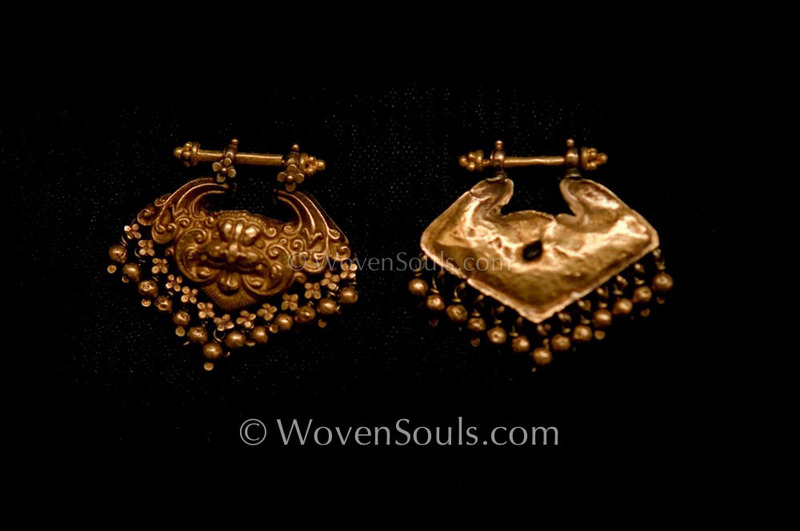 This entry was posted on November 19, 2013 by wovensouls in Art Kaleidoscope and tagged antique, antique art, antique asian jewellery, antique gold ornament, antique Indian gold, antique jewelry, antiques, art, Asia, Asian, asian jewelry, bridal jewelry, bridal jewllery, century, craft, cultural, culture, custom, diversity, Ear, ear ornament, ear ring, earring, ethnic, Ethnicity, expression, face ornament, Folk, folk art, Gold Indian, india, Indian gold jewelry, Indian precious jewellery, Jewellery, jewelry, last century, lifestyle, local, minority, old, ornament, people, peoples, ritual, sect, textile, tradition, traditional, traditional art, travel, Tribal, tribe, vintage, vintage art, weaving, wovensouls.